The Northern Mariana Islands are surrounded by coral reef ecosystems. They give us food, enjoyment, economy and protection. For all these reasons, the coral reefs our important to us. The CNMI’s Marine Monitoring Team regularly observes our reefs to track their health. They’ve collected data from the Northern Islands all the way down to Rota. Their observations (and, maybe yours someday) have given us a better picture of how well our coral reefs are doing.This site was created to introduce you to work of the marine monitoring team. Through this site you will learn to conduct one type of monitoring called a reef flat survey. Begin your lesson by clicking on WHY CORAL REEFS? on your left to explore the everyday value of our reefs. Then go on to WHY MONITOR? to learn about the importance of science for managing impacts to coral reefs. 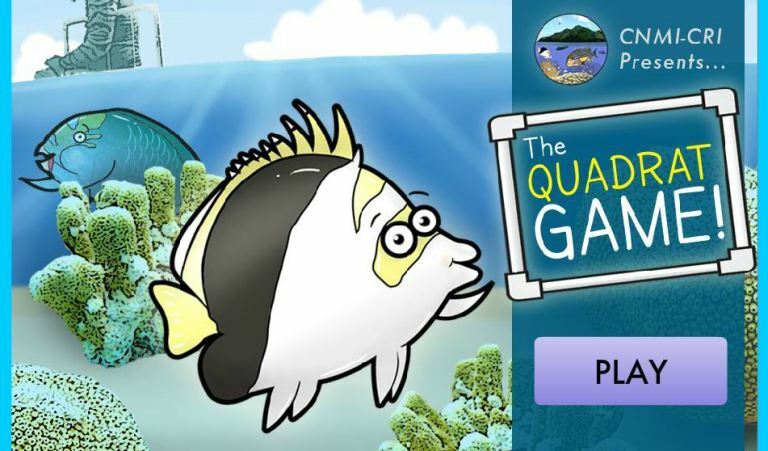 Finally, go to LEARN TO SURVEY to take the Reef Flat Survey Course, play the quadrat game and learn your species using flashcards. For conservation managers, the module compiles the latest scientific research and tools to help address impacts of climate change and other major threats and promote healthy reefs that persist over time. Watch the video for an introduction, godirectly to a section of the module using the navigation menu that appears on the left of each page, or click through the slides below to see what’s inside. Or follow this link to a simple 1 hour course on reef resilience for the general public. Coral Reefs, Polyps in Peril – a short film about the unique biology of coral reefs and their importance to people around the world, as well as the serious threats that they face due to overfishing, pollution, and climate change. But don’t let that get you down! The film also explores what individuals can do to help save coral reefs, including supporting sustainable seafood and tourism providers, reducing your CO2 footprint, and promoting coral reef conservation. Fish and People – “Fish and People” is a 5 module video education series with accompanying lesson plans and teaching resources intended for use in the Solomon Islands. It uses animation to visualise invisible life cycle and fishery management concepts. Contact Simon Foale for more info: simon.foale (AT) jcu.edu.au. Videos here, curriculum outline here.